Thousands of APAs live, work and go to school in the shadow of the Chevron oil refinery. In 1993, APEN started organizing Laotian refugees who survived war in their home country and harsh conditions in refugee camps, as well as racism and hardship in the United States. We are now building a broad base of APAs in Richmond. Champion renewable energy and jobs for Richmond residents! 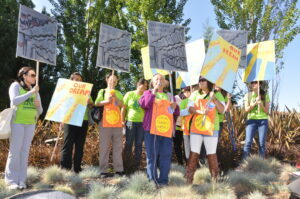 Click here to learn more about our campaign for a Chevron community benefits agreement.